This how I made my Air Quality Top Hat. It’s actually more of an Air Quality belt really, in that the sensors and the lights are attached to a strip of webbing which can then be fitted around the hat. I’ve made it slightly too long, so that it can also be turned into an Air Quality belt if you prefer. I’m using a Wemos D1 Mini and a Winsen ZPH01 particle sensor. The sensor will detect 2.5 micron particles but it’s not super stable (mind you - it is very cheap). For the light display I’ve added a strip of NeoPixels. The wiring is just point to point, with some wires twisted together, soldered and then covered with heat shrink cable. The ground line is connected to the grounds on the pixel strip, the Wenos, the ZPH01 ground and the ZPH01 control line to pull that line low and request that the sensor sends serial data out of the TX line. The 5V line from the WEMOS is connected to V+ on the ZPH01 and the V+ of the NeoPixels. The data line of the NeoPixels is connected to D4 on the WEMOS which is actually GPIO2. I’m using a lovely pixel library from Makuna which uses the onboard UART on the ESP8266 to drive the pixels. This forces them to be connected to GPIO2. I’m using a specially hand tampered SoftwareSeral driver to get the sensor data, which is read on GPIO12 which is exposed as D6 on the WEMOS device. The device is powered by a short usb cable that I’ve plugged into the WEMOS and then taped in place. I can use a USB extension lead to program the Wemos and plug it directly into a usb power bank to power the whole thing. Rather than find a plug and wire up a cable, I’ve actually soldered the wires directly to the back of the sensor. I’m not proud of this, but it does seem to work. The Air Quality sensor and the Wemos are secured to the belt by double sided adhesive foam. The software I’m using is an early release of my Monitair software for Air Quality sensors. You can find the “Top Hat” version on GitHub here. Well, that went well. Thanks to the awesome audience. Thanks to David for the donuts. Thanks to the University of Hull for the venue. Thanks to another David for filming a video. The screencast is now live. Donations are still accepted here. I’m actually ahead of myself. Amazing. 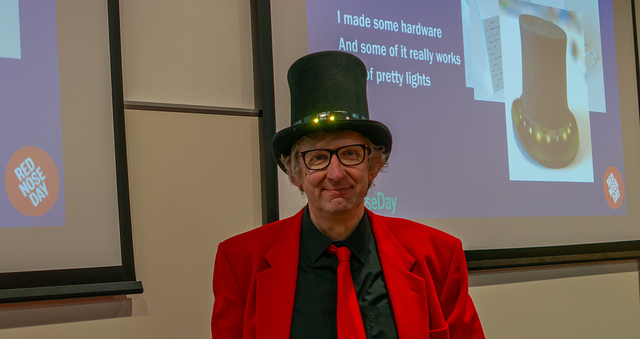 I’ve got the words for the lecture written (a mere 96 slides), the Air Quality Top Hat works, and I’ve even had time to record a quick screencast of the material. The screencast goes live after the lecture, at 14:00 GMT tomorrow on Red Nose Day. I’ll update it with footage of the event over the weekend. Oh, and you can still sponsor me here. I’ve decided to do a section of the Lecture in Rhyme as Haiku. This is because I want to reflect all genres of rhyme in my quest for poetic perfection. It also seems much quicker to write…. Behold the updated Red Nose Day Lecture poster, with new enticing banner. If you want to click on the banner you can sponsor me. I’ve been busy writing poetry today and trying to get code to work . I’m building an Air Quality Measuring Top Hat for my Red Nose Day Lecture in Rhyme next week. I think I’m the first person in the world to do this. No idea why. Anyhoo. 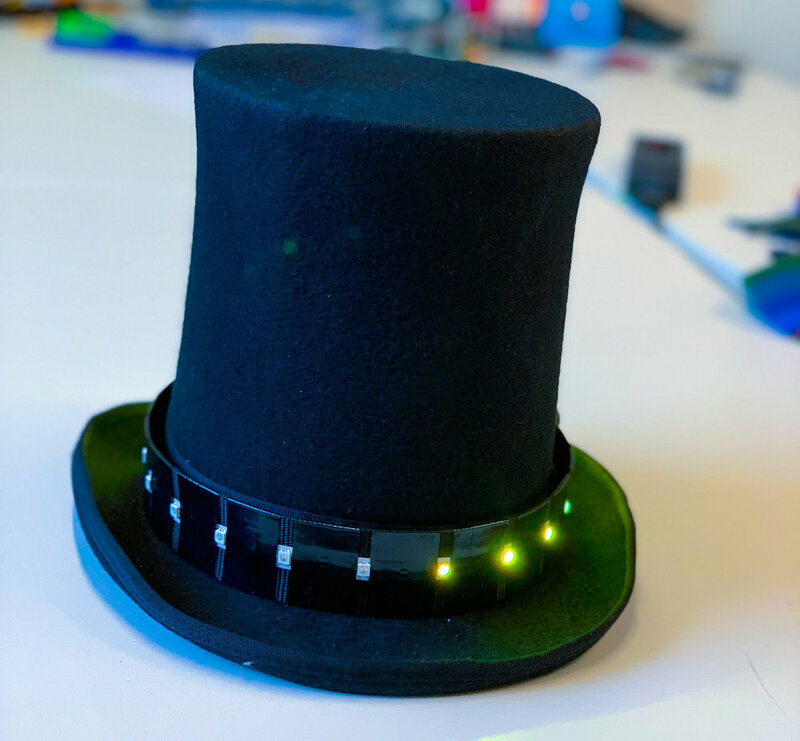 I’m going to equip the hat with a bunch of coloured leds to indicate the quality of the air around the wearer. Yesterday I started building up the hardware. I was driving all the leds with one of my trusty Wemos 8266 devices. Half way through my first test of the leds I noticed smoke rising from the device. Now, I don’t know much about electronics (obviously) but I do know that all electronic devices are actually powered by “magic smoke”. I know this for one simple reason. If you let the magic smoke out of a device, it stops working. It turns out that I hadn’t turned on my main power supply for the leds, so all the power was being drawn through the Wemos device; specifically the blackened and unhappy looking component above. Which got very hot, let out its magic smoke and stopped working. I’ve just sponsored myself for my lecture in Rhyme next week. I’d love it if you did too. Click on the image above to go straight to my donation page. If you can make it to the lecture I’d love to see you. It should be fun and there will be FREE DONUTS as well as lots of the usual fun and games. You might even learn something about air quality, which is what I’ll be rhyming about. The lecture is at the University of Hull on 15th of March (Red Nose Day) at 1:00pm in Lecture Theatre A in the Robert Blackburn Building. David from c4di-Eagles Labs is bringing the donuts. I’m bringing air quality sensors and maybe even a light up top hat. As you do. You can find out all about my illustrious Red Nose Day history at my special red nose day page. II’m doing another Red Nose Day lecture. This time I’m talking all about Air Quality. In Rhyme. Just because it’s important doesn’t mean that we can’t have the occasional (and I do mean occasional) laugh when talking about it. I’m going to talk about good air and bad air, and then describe how you can get involved and build your own air quality monitors and use them as part of the awesome Connected Humber Monitair project. It might even be interesting and useful, as well as raising some proper cash for great causes. And David from Eagle Lab Hull is going to bring along some donuts. As usual, entry to the lecture will be free, but you may have to pay to get out. If you can’t make it to the event then you can still contribute here. And there will be a video. Oh yes. And if I hit my funding target I will wear a tutu. Again. You can read more about my illustrious Red Nose Day career here. Well, that was nice. This afternoon a chap delivered a rather nice frame with an award in it from the Red Nose Day folks. I'll be doing more lectures in rhyme in the future. Try and stop me. Well, that was a fun day. Up bright and early to head up town to talk about the Great Robot Race on Radio Humberside, then home to write some poetry, then up to c4di to run the first race (which went rather well as you can see above). Then home for another radio chat, then tea and finally out to the University to deliver a lecture in rhyme. And race some more robots. This is the winner of the first ever Hull Pixelbot Great Robot Race, who succeeded by using a cunning trick called "taking the race seriously". ..and these are the winners of the rhyming race. A good time was had by all, I took 149.68 over the two events, which I've generously rounded up to 150 pounds. That'll make my total takings up to over 600 pounds once I pay it all in. Not quite tutu money, but I'm happy with that. If you want to take me closer to my 1,000 target, you can still give me some cash here. Don't forget that this Friday is Red Nose Day. I've got a couple of Hull Pixelbot themed events going on. On Friday 24th of March at 3:00 pm in the Ground Floor Boardroom at c4di we're having a Great Robot Race. We'll have lots of robots for you to drive, and a tricky course to negotiate. With a "Big Prize" for the winner. On Friday 24th of March at 7:00 pm in the Large Lecture Theatre in Applied Science 3 at Hull University we'll have "An Evening of Bad Poetry and Robot Dancing". It will be the first outing of my robot dance group, tentatively named "The Pixelbotettes" (now there's a word my spelling checker hasn't seen before). They'll be going through their routines while I attempt to find rhymes for technical terms. And just so poetry fans don't feel left out of the racing action, we'll have another "Great Robot Race", just for them. The event is open to anyone from Hull, you can find a map of the university campus here if you want to find your way to the Applied Science 3 building. Doors open from 6:30. If you're in Hull, you should come. If you're not in Hull, I'll make sure that it is all captured lovingly on video so you can enjoy (ha!) it later. Please, please, whatever you do, sponsor me here. If I get more than 1,000 pounds pledged I'll consider bringing the tutu out of retirement. If I get more than 2,000 pounds pledged I'll definitely not wear it. Now there's an incentive. Never work with children, animals or robots. My lecture will be accompanied by a horde of Hull Pixelbot robots, each of which has a mind of its own (and isn't afraid of using it). You'll even be able to control the robots yourself during the lecture. As long as you've sponsored me here. I've chosen a crack team of robots to help in the presentation. Above you can see them being put through their paces. The lecture starts at 7:00 pm in the Large Lecture Theatre in the Applied Science 3 building on the Hull University campus. You can find a map of the campus here. There is free admission to the lecture but, as always, you'll have to pay to get out. I'll have robots guarding all the doors. Please come. Bring money. Bring a friend. Bring pies. Well, there goes any level of credibility that I might once have had. The lecture in Rhyme went well, but at the start I was overcome with guilt about reneging on my Tutu promise for two years in a row. I hadn't met my, admittedly very ambitious target, but over 800 quid is not to be sniffed at. Thanks for your generosity folks. Anyhoo, I took pity on the audience (is that the right way to put it) and tutuified myself as you can see on the right. After that it was pretty much an anti-climax I guess. The audience were great and laughed at nearly all the jokes. A video was taken and I'll have it onto the Internets as soon as I can. Because the world definitely needs a man in a tutu explaining how to create video games. Anyhoo, the result of this was an invite from Samantha Cameron, wife of the Prime Minister, to a reception at Number 10 Downing street. Along with a stern injunction not to make a fuss until after the event was over, for security reasons. The good news is that now I can tell folks about it. The great news is that the event was amazing. We turned up with a mix of fund raisers and Red Nose Day partners and spent a while in this posh reception room drinking free drinks and eating free food. Samantha Cameron gave a lovely speech about the work of the Red Nose Day folks and then David Walliams, of Little Britain and Channel Swimming fame, turned up and read his Comic Relief book "The Queens Orang-utan" . Finally there was a speech from the Comic Relief head honcho, who's name I've sadly forgotten. Apparently they expect the charity to break the one billion pounds raised barrier on Friday, which would be completely amazing. Another David, David Tennant, turned up to mingle. Sadly he moved on before I managed to have a chat or grab an autograph, but I did manage to get an autographed copy of David Walliam's book, which was wonderful. After that we had more mingling, drinks and nibbles. Turns out all the folk involved with Comic Relief are all splendid people. Who'd have thought? Then, on the way out we all queued patiently to take our pictures on the hallowed threshold of the home of the Prime Minister. There was a strict embargo on the use of phones and cameras during the event, but it was nice to get one "I was there" image. I do the lectures because they are an interesting challenge to write and great fun to deliver. Plus they bring in a bit of cash. It was really nice to be recognised for the work. The next lecture is on Friday 13th of March at 12:15 in the Robert Blackburn Building on the University of Hull campus. If I hit my target, I'm wearing a tutu to deliver the lecture. You can sponsor me, and bring me one step closer to total embarrassment, here. If you have discovered that what is missing from your life is a small, 3D printed piece of plastic with a unique arrangement of disks and squares on it, in a variety of colours, then I have just the thing for you. A Red Nose Day tag. They are on sale in aid of Red Nose Day from our Departmental Office in Computer Science. They look great on a key-ring or as novelty ear-rings. Every one is unique and we will be using them in the lecture on Friday for some fun and games. They only cost a pound each. Bargain. And don't forget that you can sponsor me, and maybe get me into that tutu, here. If you have a Windows 8 or more PC, or a Windows Phone 7 or more phone, you can sample my wonderful Robs Red Nose Game. Once you've played it for a while you can then go and sponsor me here. When it asks you to touch all the noses, it means at the same time. I promise there won't ever be more noses than fingers. When it asks you to turn the nose upside down, turn your phone or tablet face down. According to Peter this works really well with docked Surface machines. Or something. It gets really hard in the later levels, when the noses start falling off the screen. Last time I did a Red Nose Day Lecture in Rhyme I offered to wear a tutu if I hit my target on the sponsorship page. Rather sadly we missed by only 16 pounds. This year the offer still stands, and to show my faith in my sponsors I've actually bought the tutu. So, if you want to see me make a complete fool of myself, as opposed to the incomplete version that is normally on show, you can sponsor me here.